Philosophical and religious vaccine exemptions have been a hot topic lately with California's AB 2109 Bill which would require parents who wish to opt out of vaccination obtain an approved healthcare providers' signature that the parents have been advised of the risks of not vaccinating. And Washington State's recent passing of the same type of bill has anti-vaxx groups in a collective apoplexy. New Jersey is also discussing tightening their religious exemptions and a new bill S1759 has been submitted to the state Senate for a vote. New Jersey has no philosophical exemption so its religious exemption has been easily used for parents to opt out of vaccines. I like others have a problem with just religious exemptions for the reason that there are no recognised religious organisations that oppose vaccines and they also exclude secular beliefs. In fact, there is no constitutional right or protection requiring religious exemptions to be provided. There are no constitutional protections from compulsory vaccination for philosophical reasons either in spite of vapid assertions to the contrary. An Equal Protection challenge to vaccination regulations was denied in Zucht v. King as the U.S. Supreme Court ruled that vaccination laws do not discriminate against schoolchildren to the exclusion of others similarly situated (i.e., children not enrolled in school). (221) In the case of Adams v. Milwaukee, Justice Brandeis reaffirmed Jacobson's holding that states may delegate the power to order vaccinations to local municipalities, and that broad discretion must be granted in the application and enforcement of the resulting public health regulations. (222) In Prince v. Massachusetts, the Supreme Court held that the First Amendment's Free Exercise Clause does not allow for the right to expose the community or one's children to harm from disease. (223) An Arkansas court later affirmed that school vaccination requirements do not deprive individuals of liberty and property interests without due process of the law. (224) Moreover, even where a parent objects to compulsory vaccination, a child does not have an absolute right to enter school to receive an education. (225) Clearly then, the rights of individuals to be free from unwanted government interference in the form of compulsory vaccinations have been severely limited by the courts where public health is at stake. But what about the constitutionality of compulsory vaccinations where no exemptions at all are provided--i.e., neither for philosophical nor religious reasons? Again, the judiciary has held that individual rights may be restricted in the name of the public welfare without violating the Constitution. States that do offer religious exemptions place themselves in a more precarious position legally. As it stands now, 48 U.S. states allow religious exemptions and 20 allow philosophical exemptions. Some retrospective analyses of Arkansas, which allowed philosophical vaccine exemptions beginning the 2003-2004 school year have revealed a startling trend which has been observed in other states as well. Total exemptions numbered 529 in Year 1; 651 in Year 2; 764 in Year 3; and 1145 in Year 4. Between Years 1 and 2, the total number of exemptions granted rose by 23%. After philosophical exemptions were allowed in Year 3, total exemptions granted increased by 17% over the previous year, and by 50% more from Year 3 to 4 (Figure 1). In Year 3, nonmedical exemptions (including religious and philosophical options) were 1.37-fold higher than nonmedical exemptions in Year 2 (139 versus 64) and 1.67-fold higher than nonmedical exemptions in Year 1 (110 versus 64), when religion was the only option for nonmedical exemptions. In Year 4, nonmedical exemptions (62) were 2.12-fold higher than in Year 2 and 2.58-fold higher than in Year 1. In Years 3 and 4, the majority of the nonmedical exemptions (58% [403 of 700] and 67% [721 of 1083], respectively) were based on philosophical rather than religious (297 and 362, respectively) reasons. Medical exemptions constituted 21% of all exemptions in both Years 1 and 2. However, with the introduction of philosophical exemptions, the absolute number of medical exemptions dropped by more than half (from 139 in Year 2 to 64 in Year 3 and 62 in Year 4). Thus, medical exemptions accounted for only 8% of Year 3 and 5% of Year 4 exemptions. Emphasis added. This is a concerning statistic as it would appear "vaccine-friendly" physicians may have been issuing medical exemptions where they weren't medically-indicated. This seems to be an unintended finding that should be addressed by public health officials in concert with state medical regulators. Analysis of exemptions by vaccine type revealed that in the 2009 –2010 school year, 70.8% (1922) of exemptions were requested for all vaccines, 9.2% (249) were requested for two or more vaccines, and 20% (543) were requested for a single vaccine. A similar pattern also was seen for previous years. More than 92.8% of single-vaccine exemptions requested were for the measles, mumps, and rubella (MMR) vaccine and 4.6% were for both hepatitis B and varicella. Of 504 single MMR vaccine exemptions, 436 (86.5%) were requested for college students. MMR vaccine is the only required immunization for college enrollment in Arkansas. Private schools are not included in the collection of these statistics and given the date of the incident, Safi et al. were unaware of this recent Arkansas boarding school measles outbreak. It has also become well-known that Waldorf Schools have become hotbeds for high vaccine exemptions and thus pertussis and measles outbreaks. The MMR triple jab had the highest number of exemptions for school age and university students which appears to be a shameful repercussion of Wakefield et al. 's fraudulent and retracted Lancet paper even over a decade after the fact. The recent moves by various states to tighten the ability to acquire non-medical vaccine exemptions are laudable but rather futile efforts that are easily overcome by determined anti-vaxx groups whether it be through convincing credulous politicians to ignore experts in Vermont, lobbying California to include naturopaths as an approved healthcare practitioner to provide vaccine exemption counselling for AB2109 (which is as good as a rubber stamp) and challenging states over the constitutionality of tightening existing religious exemptions such as New Jersey. Parents who hold these beliefs will not be swayed by a brief meeting with a "healthcare practitioner" who will be undoubtedly shopped for in order to provide a signature needed to be on their way as quickly as possible. These measures will not increase vaccination rates in any appreciable way. Political-correctness and pseudo-scientific grandstanding have no business in public health policy, only solid scientific evidence does. What can States do About Balancing Parental Rights with Public Health? It's rather easy, in theory at least but would provide parents and public health with the fairest way to balance their respective interests bearing in mind that public health policies are measures to create benefit and protection for the majority of a population. States would eliminate, or more realistically reduce the number of legal challenges that can be made by simply providing philosophical exemptions. There are secular reasons for seeking vaccine exemptions and no religious belief should be deemed superior to another in the matter of exemption from vaccines. Track specific vaccine exemptions rather than make them "all or nothing". States such as California and Colorado are already doing this (more or less). This provides more accurate data regarding vaccine uptake and provides schools requisite information to manage outbreaks more fairly and effectively. As it stands now, any student with a vaccine exemption is required to stay home from school in the event of an outbreak which can mean several weeks out during the school year. This may be rightfully deserved according to some but ultimately, the children suffer for the parents' actions and tutors are provided by schools at taxpayer expense if a certain number of consecutive days are missed. Allowing selective exemptions would prevent unnecessary exclusions from school. For example, a student with an exemption for hepatitis b would be allowed to remain in school in the event of a measles outbreak. Parents who have an "all vaccines" exemption on file for their children would of course be required to stay home in the event of an outbreak of any VPD. Outbreak control measures may include requiring students stay out of school for an outbreak of a VPD anywhere in the school district rather than just at the school of enrolment given disease transmission dynamics and incubation periods. Washington became one of the first states to develop explicit criteria when its Board of Health convened an Immunization Advisory Committee in 2005 to provide recommendations for how to determine whether a new antigen should be part of the State's required immunizations for entry into school or child care.51 The Washington State Board of Health realized, in part, that rigorous criteria were needed as it became clear that several vaccines in development were likely to be recommended for children and adolescents and proponents were likely to propose mandates. Indeed, in 2005, the quadrivalent conjugate meningococcal vaccine was licensed, followed by the first human papillomavirus (HPV) vaccine and the first rotavirus vaccine in 2006. Washington State's 9 criteria are grouped into 3 categories: vaccine effectiveness, public health disease burden, and implementation.52 These criteria are meant to sufficiently address the different layers involved in public policy decisions. There are 4 criteria of vaccine-effectiveness; (1) the vaccine containing the antigen has been recommended by Advisory Committee on Immunization Practices; (2) its effectiveness has been established by immunogenicity; (3) it is cost-effective from a society perspective; and (4) it is safe with an acceptable level of adverse effects. The 2 public health burden criteria are (1) that the vaccine containing the antigen prevents a disease that has significant morbidity and/or mortality; and (2) that vaccinating children and adolescents reduces transmission of the disease. The last 3 criteria reflect implementation of the vaccination program: the vaccine must be acceptable to the medical community and the public, the administrative burdens of delivering the vaccine must be acceptable, and the burden of compliance for vaccination is considered reasonable for the parent. The process for evaluating an antigen for inclusion in school mandates in Washington State involves 3 steps. The Board of Health first does a preliminary review of the antigen of interest to determine whether there is enough information about the antigen for the 9 criteria to be used. Second, a group of representatives from public health, primary care, epidemiology, ethics, and others (such as parents and school administrators) is appointed by the Board. Finally, these appointees review the antigen in question using the 9 criteria and provide a recommendation to the Board. Although these criteria and the process in which an antigen is evaluated against them require some clarifications, they offer a deliberate and informed approach to determining which vaccines should, and should not, be required for school entry.51 Washington State's Board of Health used these criteria to include the meningococcal vaccine as part of the require immunizations for school entry in 2005. Washington State does not include the HPV or rotavirus vaccines in its school immunization laws. Other states have come to different decisions. As of June 2009, school mandates exist in 18 states for the meningococcal vaccine,53 and in 2 states (District of Columbia and Virginia) for the HPV vaccine.54 No state has a school mandate for the rotavirus vaccines. Such a process will ensure that an evidence-based approach will be implemented to decide which vaccines should be part of school vaccine mandates. Such an evidence-based and transparent method may also serve to address some parental fears about vaccinating by addressing individual state's VPD epidemiology. The State of West Virginia (which only has a medical vaccine exemption) requires this already. Many or most U.S. private and parochial schools do not require vaccines for school entry and/or attract anti-vaxx parents with easy opt outs for vaccines. Some of these schools have exemption rates of over 80%, particularly Waldorf Schools. Since schools are the primary sources of disease transmission, there is simply no justification for allowing private and/or parochial schools different standards for vaccine requirements. Given the alarming numbers of philosophical and religious exemptions that some state school districts and counties are issuing, it has become necessary to cap the number of non-medical exemptions for any given school. These exemptions are based upon pseudo-scientific information that is easily available to credulous parents concerned with vaccine adverse effects; there is no reason to continue to entertain these fallacious beliefs and extraordinary senses of entitlement in the form of high numbers of vaccine exemptions that erode herd immunity. Herd immunity assumes the equal distribution of susceptible people; this very crucial aspect of herd immunity is compromised by high numbers of non-vaccinated geographically-clustered, particularly at a school level. In order to achieve herd immunity threshold, the minimum percentage of people vaccinated for a disease is based upon vaccine effectiveness, disease transmissibility or infectiousness (for example measles is far more transmissible than hepatitis b so a higher percentage of people need to be vaccinated for the former than the latter), population mixing and vaccine failure. For example, measles vaccination uptake to achieve herd immunity threshold is estimated to be 90-93% due to the extremely high infectiousness of measles and an estimated 5% primary vaccine failure rate. And again, that is also assuming an equal distribution of susceptible people in a large population. There are several school districts and/or counties throughout the U.S. that do not reach this threshold, California being a glaring example. Using measles again as an example of how to cap philosophical exemptions and hypothetical school A with a student population of 1000 students, the upper limit for the number of unvaccinated children must be lower than 7% to account for clustering of susceptible children, let's arbitrarily say 4% which would be 40 students. Medical exemptions would be provided first, next allow selective vaccinators in order of one and two vaccines refused and if the 4% exemption for measles vaccination hasn't been met then full vaccine exemptions can be provided for the remainder. A higher number of exemptions could be allowed for say, hepatitis a and b but a lower number for pertussis. Such a system would "reward" those who have their children vaccinated the most according to state mandates and encourage at least some vaccination. Implementation of philosophical exemptions could be done by lottery and monitoring of medical exemptions which would have the potential for abuse should be considered. This is in line with what Washington State has already enacted and what California may be next in doing. With all due respect to these state's public health officials, higher standards of informed consent with greater efficiency need to be implemented. Instead of requiring a signature from a "healthcare provider" which can mean naturopaths who are notoriously anti-vaccine or one of Dr. Bob Sears "vaccine-friendly" doctors, hold public seminars for potential philosophical exemption-seekers with qualified professional scientists and/or physicians. Said professional scientists and/or physicians would be very familiar with anti-vaccine arguments, websites and purveyors of vaccine misinformation in order to more adequately address parental concerns and objections to vaccines. A single speaker could reach hundreds of parents at a time taking the burden off of individual providers, disseminate much more relevant information, while dismantling anti-vaccine myths and provide statements of informed consent at the end of the seminar. Some may ask why even bother to have philosophical exemptions but I feel as though our society can withstand a certain amount of individual freedoms without infringing on the safety of others. However, there are some areas of the U.S. that appear to have a disproportionate number of parents who feel as though their own entitlements supersede those of the community to the point that once-eliminated or lowly endemic vaccine-preventable diseases are creating outbreaks with their direct actions. Although philosophical and religious vaccine exemptions are a politically-charged issue, medical science must be the basis for public health decisions and not emotive, politically-motivated ones. Contrary to popular belief, we do not have a constitutional right to philosophical nor religious vaccine exemptions; the courts have been clear on that. Such exemptions are a privilege and unfortunately, a privilege which is being abused to the point of endangering society and must be adapted to protect the larger society while maintaining some ability for individual freedoms. 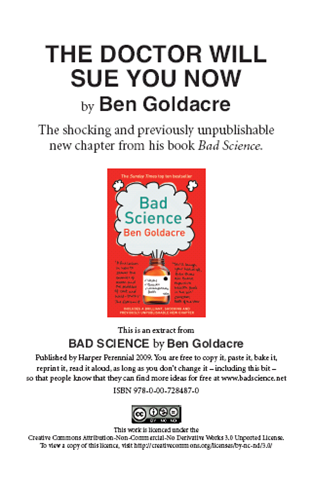 Those of you who have followed the story of "Bad Science" will know that the first edition was missing a chapter, because the dangerous quack discussed in that story was suing Dr. Goldacre. The chapter appeared online after the law suit and was added to the second edition of the book. So to be clear, this whole book is about meticulously defending every assertion in the paragraph that follows. Drugs are tested by the people who manufacture them, in poorly designed trials, on hopelessly small numbers of weird, unrepresentative patients, and analysed using techniques which are flawed by design, in such a way that they exaggerate the benefits of treatments. Unsurprisingly, these trials tend to produce results that favour the manufacturer. 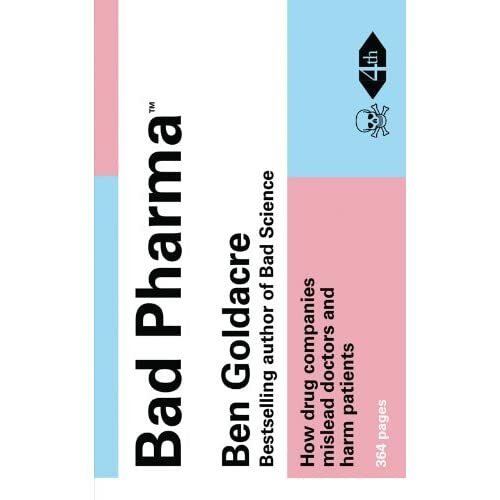 When trials throw up results that companies doesn’t like, they are perfectly entitled to hide them from doctors and patients, so we only ever see a distorted picture of any drug’s true effects. Regulators see most of the trial data, but only from early on in its life, and even then they don’t give this data to doctors or patients, or even to other parts of government. This distorted evidence is then communicated and applied in a distorted fashion. In their forty years of practice after leaving medical school, doctors hear about what works through ad hoc oral traditions, from sales reps, colleagues or journals. But those colleagues can be in the pay of drug companies – often undisclosed – and the journals are too. And so are the patient groups. And finally, academic papers, which everyone thinks of as objective, are often covertly planned and written by people who work directly for the companies, without disclosure. Sometimes whole academic journals are even owned outright by one drug company. Aside from all this, for several of the most important and enduring problems in medicine, we have no idea what the best treatment is, because it’s not in anyone’s financial interest to conduct any trials at all. These are ongoing problems, and although people have claimed to fix many of them, for the most part, they have failed; so all these problems persist, but worse than ever, because now people can pretend that everything is fine after all. In short - the book that everyone should read and that could be the beginning of something amazingly beautiful: evidence-based medicine. For those of you in the US - ask a European friend to send you the book or bridge the time until January 2013 with reading Ben's excellent blog. NOTE: I linked to Amazon.co.uk and Amazon.com up there, but if you have a chance, support your local book store and buy it there. Edited to add: David Colquhoun, the excellent pharmacologist and skeptic has weighed in. I have changed the book link to a store which pays taxes in the UK following his example. The Health Protection Agency (HPA) can confirm the diagnosis of one laboratory confirmed case of severe respiratory illness associated with a new type of coronavirus. The patient, who is from the Middle East and recently arrived in the UK, is receiving intensive care treatment in a London hospital. In recent months, this new human coronavirus was also identified in a patient with acute respiratory illness in Saudi Arabia, who subsequently died. This comes after the death of a man from the same virus in Saudi Arabia. With the Hajj starting in a month from now, the risk of an outbreak is very real and health personnel is being advised how to deal with patients with respiratory illnesses accordingly. Update: what the WHO says. The school has just over 130 students enrolled. .../... According to NYS Health Commissioner Shah, nearly half of the students have not been immunized for measles. Students and staff who have not been immunized have been excluded from the school until the danger of infection passes. While measles immunization is a requirement in New York State, private schools have the authority to make exceptions. The concern in New Paltz is for anyone who may have attended or visited the school after September 10. Eighty of the private grade school's 145 students were sent home, said Ulster County Health Commissioner Carol Smith. Since the weekend, 27 children have been vaccinated and allowed to return to school, Smith said Monday. One Mountain Laurel parent, John Ascione, has two children attending the school; both have been vaccinated. He characterized opposition to vaccination as a result of skepticism by some parents of children attending an alternative-minded school to what he called the "corporate influence" in such institutions as the Food and Drug Administration and the CDC. I wonder whether he and the other parents are fully aware of the Steiner philosophy and that it is not just a squishy, nacheral, crunchy alternative to teh ebil FDA/CDC run world. The Dutchess County Department of Health announced today a confirmed case of measles in a student at the Mountain Laurel Waldorf School in New Paltz, NY. Anyone who has visited this school since September 10th or has had any contact with anyone from this school should immediately make sure that they are up to date with their measles vaccinations. All medical practices and laboratories in the area should be on high alert that there may be a number of other children and families who have been exposed and could be communicable. We have learned that a number of students at this school were not vaccinated and may become ill and put other children and families at risk for contracting measles. Mountain Laurel Waldorf School has no alert on their website, but if the student attended the school for several days before being diagnosed, it may be too late anyway. A potential feast for epidemiologists (and bloggers), coming at high risk for the children involved. At the higher emotional and mental levels, negative forces such as greed and selfishness have also been expelled. So a child who has measles is afterwards less self-centered and more openhearted, and often more able to express his or her individuality. The personality becomes rounder and fuller, and more joyful and contented, as a step towards maturity and adulthood. Serious complications in childhood illness which produce permanent damage or even death are probably deeply founded in the destiny of the person concerned. Yes, totally out there, but so is the entire cult (see Melanie Byng's excellent three part series on DC's Improbable Science blog). Steiner Kindies and schools and anthroposophically minded doctors have therefore been doing a great job in keeping measles circulating and racking up impressive case numbers, like the 174 within 3 weeks at a 300 pupil Steiner school in Salzburg in 2008 or the 400+ cases in the practice of one doctor in the 1999/2000 measles outbreak in Coburg Bavaria. Hopefully, this new outbreak will end with as few cases as the recent outbreak at Ozark Adventist Academy. Previously we posted The Toxin Gambit 1: Formaldehyde which was an in-depth examination of what formaldehyde is, actual toxic doses and the amount in vaccines. We feel these examinations are important for parents who have been frightened into believing that vaccine excipients are harmful when they are, in fact not, particularly in the amounts contained within vaccines. A blogger who goes by the name of Amanda is one such person attempting to either justify her own fears of polysorbate-80 and/or trying to frighten others. In either case she is demonstrably wrong with her interpretation of information and is a case study in why you should pay attention in maths classes. There is information on toxicity though - the LD50 (dose at which half of the experimental animals die) is 34500 µl (microliter) per kilogram body weight - this is the equivalent of 24 teaspoons (or 36.6 grams, see below) full of pure Polysorbate 80 for a 3.5 kilogram newborn baby. A huge amount. Vaccines contain a maximum of 100µg per dose (that is threehundredandsixtyfivethousandsevenhundred [365'700] times less than the LD50 for a newborn, we ingest 1000x that (100mg) per day, since Polysorbate 80 is used as an emulsifier in many foods (for example ice cream, yumm). I’m as apprehensive as the next guy when it comes to animal studies and results given. If you give a rat (or any animal for that matter) large doses of any chemical I’m sure cancer and health issues will ensue. However, this study is interesting. If we assume the baby rats weighed 6 ounces (which baby rats do normally weigh between 5-6 ounces), to be equivalent, the prepubescent teenage girl would have to weigh approximately 300 lbs. Wow! That is horrible! Horribly wrong that is. Let me take you through this. We'll start with some basic measurements. 1 ml of Polysorbate 80 weighs 1.06-1.09 g, so it is a bit denser/heavier than water - I will calculate with 1.06 from here on. An ounce is 28.35 g - 6 ounces are 170 g, about the weight of a full baby bottle. 300 lbs are about 137 kilograms (that is one big preteen).